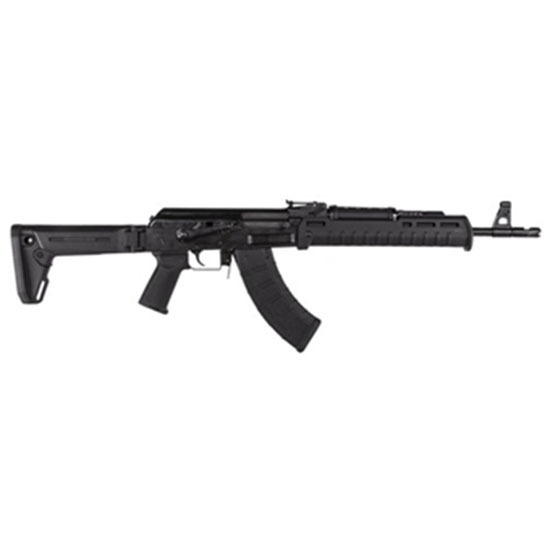 Century RI2400N C39 V2 Semi-Automatic 7.62x39mm 16.5 30+1 Synthetic Black Stk Black Nitride in. The Centurion 39 line of semiauto rifles is 100 American made. It features a milled receiver machined from a solid 11 lb. block of 4140 ordnance quality steel larger tee shaped magazine catch AKM furniture compatible bolt hold open safety and an enhanced dust cover. The chrome moly nitride treated barrel has a concentric left hand 14x1 metric thread ready for a suppressor. The AK side scope rail mount to offers a return to zero capability also offers four times clamping improvement over traditional side scope rail mounts and improves sight acquisition for follow up shots. The C30v2 accepts all standard AK magazines and comes with one 30round Magpul magazine.